He calls it a catch 22 — the name he gave to his brand new restaurant at the corner of Georgia and Missouri avenues in Washington. Catch 22 because-- he may hate cooking, but customers sure seem to love what he cooks. Davis said he and his sister moved around a lot when they were kids. His mother was on drugs and his father was killed when he was a kid, so he and his sister were shuffled between relatives and family acquaintances. Born in Richmond, Virginia, they wound up in Washington where they continue moving from home to home. Davis ended up in Atlanta, and at 16, he was living on the streets, surviving on petty crimes. “That’s how I survived in the streets for the longest as I was in the streets, was just robbing and stealing,” he said. Until he got into the restaurant business. “I really got in the restaurant business so that I could eat,” he said. He took a job as a dishwasher at a McDonalds in Atlanta, then kept moving to bigger and fancier restaurants, always beginning at the sink and moving up. He watched and he learned. 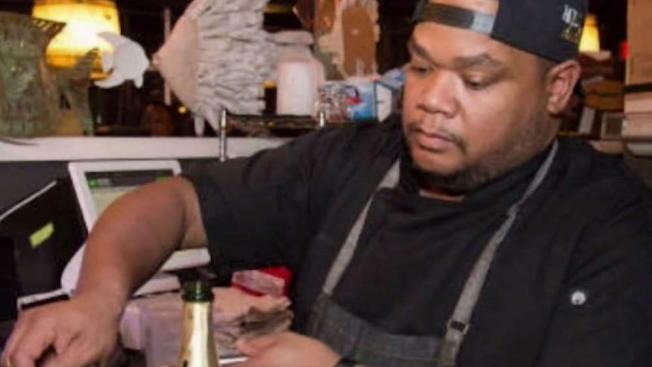 He began opening restaurants in Atlanta, and a win on Food Network's "Chopped" made him a familiar culinary name across the country. He now owns three restaurants in the D.C. area, packing folks in, especially for the shrimp and grits — a mainstay at Catch 22. Another funny catch: He was afraid of the ocean as a kid and now he’s like an "old salt" when it comes to cooking seafood. Just don't call him a chef. “Hopefully we go from chef to restaurateur to just Sammy Davis,” he said.